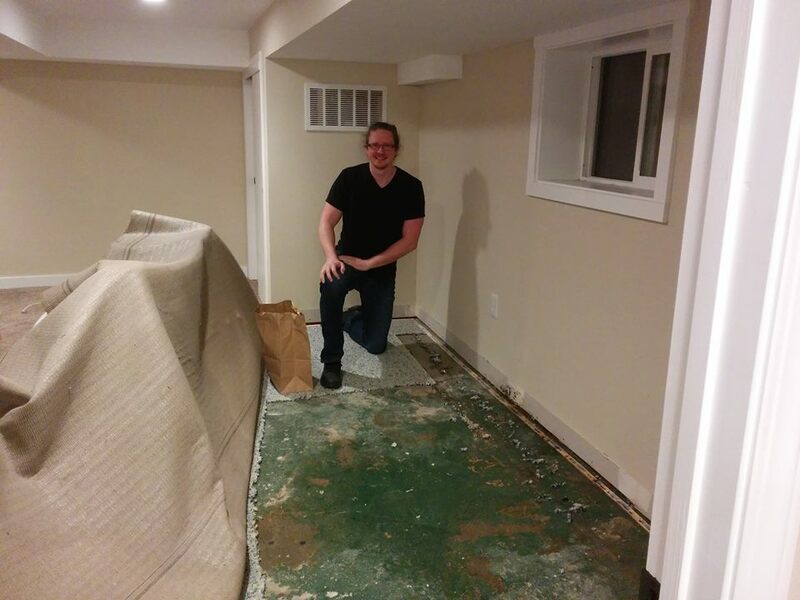 We knew when we bought our house that the basement might have problems. The people we bought it from had just finished the basement, everything looked really nice. But it was obvious it hadn't been through a Seattle winter yet. And because it was newly finished the things you'd typically look for (signs of previous water damage) were either covered over or no longer visible. For all we knew the basement would turn into a lake the first time it rained. Shortly after moving in we had a couple big storms - lots of rain and wind, power out, that kind of thing. And we've had a very typical winter this year, with rain more days than not. So far there'd been no signs of water in the basement, so I'd figured we were good to go. Lucky us. Thursday I got the kids off to school and sat downstairs to eat my breakfast. Headed off to school and picked Mal up afterward. I went to get some work done at the computer and thought, "hm, my socks must've got a bit wet while walking to my car/picking up Mal" (not surprising because my boots are old and have developed a couple leaks). But a few minutes later I realized that there's no way my thick socks got that wet, pushed back the chair, and saw that the carpet under the desk was wet. I initially assumed it might be water coming up through the floor, because the carpet near the wall was still totally dry. But once Ryan got home and moved the desk I realized that where the feet of the desk had been - much closer to the wall - was also wet. We figured out how to remove the baseboard (which our contractor neighbor later told us may not have been necessary - oh well, new thing learned anyway!) and pulled back the carpet. In removing the baseboard we discovered a small bit of sheetrock with mold on it. Our neighbor came over and since all the water was located almost directly under a window, told us he guessed it had something to do with the window - either the window was installed improperly and so water was getting in, or maybe the dirt making a bowl around the window was the culprit (almost certainly not helping the problem at any rate). 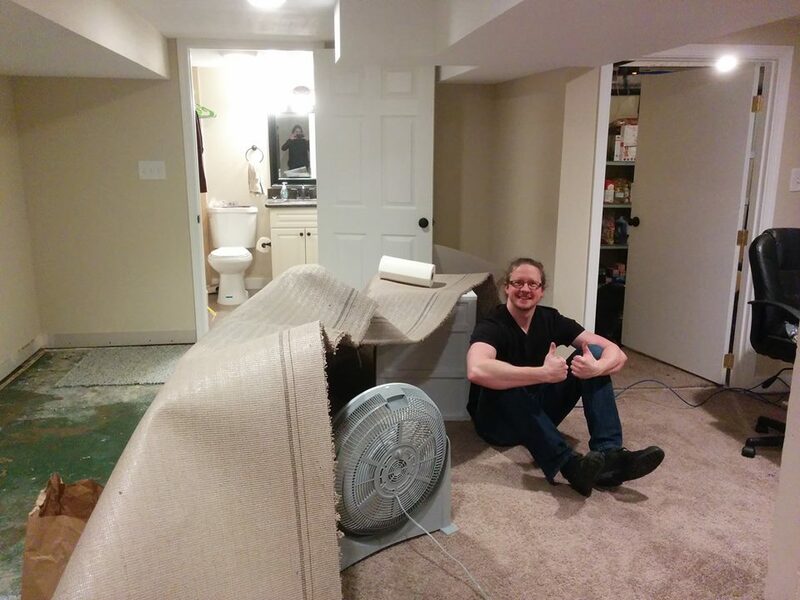 After he left we got the padding pulled up and tossed it out, and propped up the carpet and set up some fans so it could dry a little faster. So now we get to decide how much money we want to throw at this problem. Do we get the land regraded and install a pipe/drain thing or do we guess that perhaps a foundation drain has failed or needs to be installed and pay for that and the regrading? If we do option 1 then realize the problem isn't fixed, some of it will have to be dug up to do option 2. If neither of those solve the problem then we'd maybe have to dig stuff up yet again to determine what the actual problem is, wasting even more money. Argh. Anyway, we had a landscape/drainage person come out and give us an estimate. We'll have another drainage company come on Thursday and see what they say. Our neighbor seemed to think we shouldn't worry about the possible mold inside the walls and just clean what we can see off with bleach. But I really don't want to go that route (we dealt with mildew/mold in our Indiana place, really don't want to again), so no matter what we'll at some point rip out that wall so we can replace any wet insulation and deal with any mold. Our neighbor told us that they've had a river of water flowing through their basement a couple times, so apparently if this is the worst it gets we're pretty lucky. (And I can say from experience that this is better than 5 feet of water in the basement.) I'm starting to wonder if we'll ever get to do the projects we want to do on the house rather than just dealing with the unexpected problems that crop up. Home ownership is so much fun. Good luck with your basement!!! I'm sorry you've been having water problems as well! It's at least reassuring to know others have similar problems. That this is often just part of owning a house, not necessarily that we made a horrible choice in buying this particular house. I'm really hopeful that it is primarily a surface water problem and we just need to fix that (because that's obviously the least expensive solution). But we have to pick a way to try to fix it at some point, and there very well might not be a way to know for sure that what we're picking is the correct solution. Or we might have to rip out a wall to know for sure. And what if we fix this and then have water problems in another location - or maybe we already do but just haven't discovered them yet. The "what haven't I found yet" thoughts are horrible! This reminds me of a couple of summers ago when we arrived at my mother's house to stay for a few days and discovered that rainwater had been leaking in through the basement window, probably several times over the past few months. We spent most of the next day emptying her bookshelves, pulling up the carpet, removing as much water as possible from the foam pad with a shop vac, and then cutting it up and pulling it out. We put chairs under the carpet and started some fans going. It looked very similar to your pictures. Sounds like you did the same thing we did. After we left, my brother brought in some new foam and got the carpet and shelf units put back in. They also pulled back the grass and removed some of the soil so the rainwater would run away from the window and attached a longer hose to the drain pipe close by so the runoff from the roof would be carried farther away from the house. It worked. I hope you are able to find the best way to prevent future flooding.